Showing items in category South Australia, sorted by newest listed first. AUSTRALIA (South Australia) - 1912 1d rate postcard use locally used at EUDUNDA/S.A. 1912 (NO.14.) 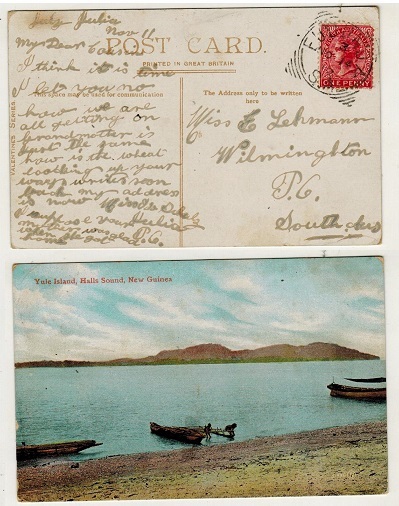 use of picture postcard addressed locally depicting 'Yale Island, Halls Sound, New Guinea' bearing South Australia 1d adhesive tied by squared circle EUDUNDA/S.A. cds. 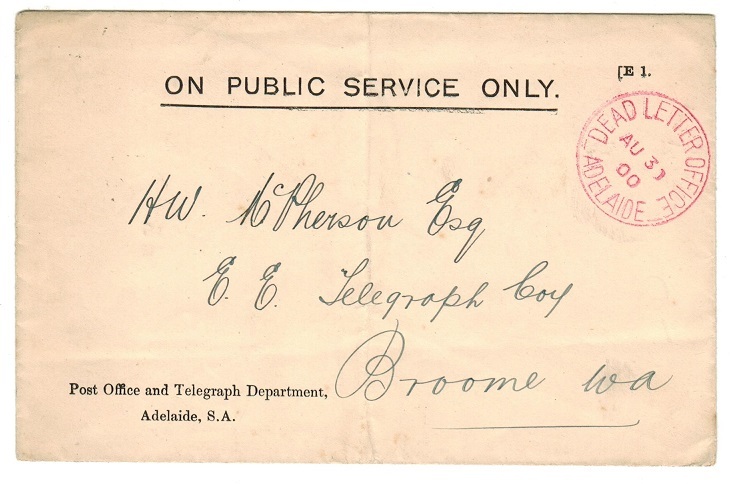 AUSTRALIA (South Australia) - 1899 1d brown 'OHMS' PSC used locally at ADELAIDE. H&G 5. 1899 1d brown on cream postal stationery postcard addressed locally overprinted O.H.M.S. in black at top (under lined) and cancelled by ADELAIDE roller strike dated FE.17.1911. 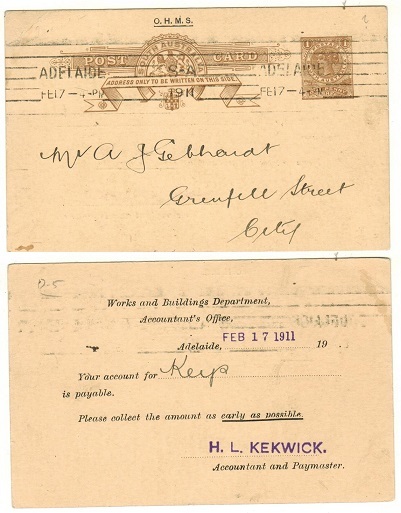 A scarcer official card with 'Works and Buildings Department' pre-printed reverse. H&G 5. 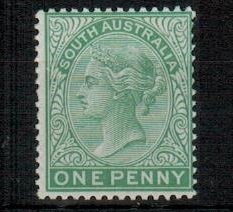 AUSTRALIA (South Australia) - 1901 1d COLOUR TRIAL in green on unwatermarked paper. 1901 1d (SG type 11) COLOUR TRIAL printed in the issued colour of green but with perf 14 (un-issued) and on UNWATERMARKED paper. AUSTRALIA (South Australia) - 1902 5d registered 'O.S.' use on Public Service cover. 1902 (FE.4.) use of ON PUBLIC SERVICE (Police Department) envelope registered locally (central fold) bearing 1d rosine and 2d violet (x2) wide 'O.S.' overprint adhesives tied by REDRUTH squared cancel. Curved REGISTERED/No. h/s at left. Rated rare by Overton. 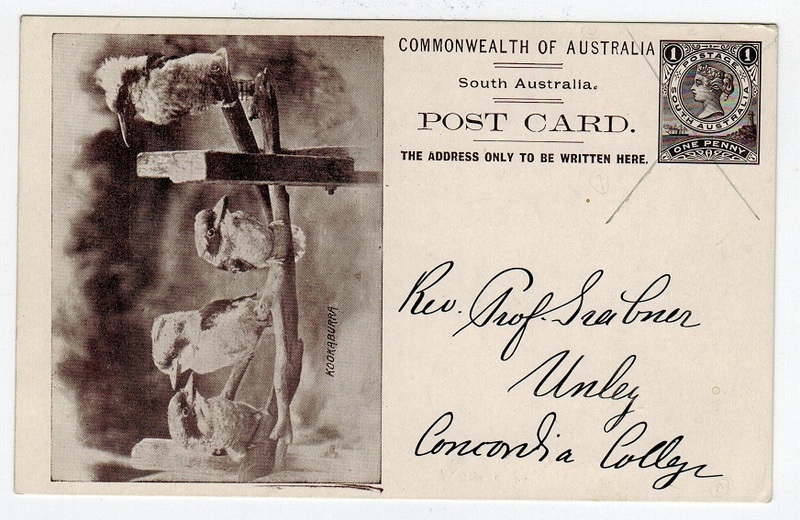 AUSTRALIA (South Australia) - 1900 3d 'O.S.' rate OHMS wrapper use from ADELAIDE. 1900 (FE.1.) use of O.H.M.S. 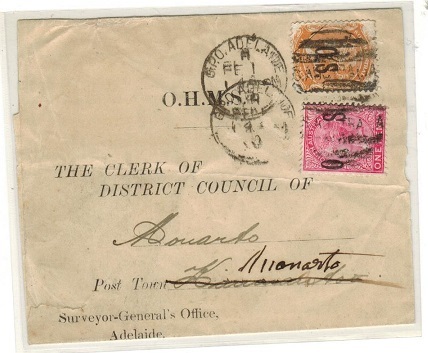 (Surveyor-Generals office/Adelaide) wrapper addressed locally bearing 1d rosine with wide 'O.S' overprint and 2d orange brown perf 13 narrow 'O.S' overprint issues tied by S.AUSTRALIA grilled dulex with GPO ADELAID cds at left. AUSTRALIA (South Australia) - 1901 1d COLOUR TRIAL in issued colour on UNWATERMARKED paper. AUSTRALIA (South Australia) - 1901 2 1/2d rate cover to UK used at MOUNT GAMBIER. 1901 (MR.27.) cover addressed to UK bearing 1/2d and 2d adhesives tied by squared circle MOUNT GAMBIER/SA cds. AUSTRALIA (South Australia) - 1901 5d rate registered cover to UK used at ADELAIDE. 1901 (JA.1.) registered cover to UK bearing 2 1/2d and 3d adhesives tied by squared circle REGISTERED ADELADE/SA cancels. AUSTRALIA (South Australia) - 1900 2 1/2d rate cover to UK used at GPO ADELAIDE. 1900 (MY.9.) 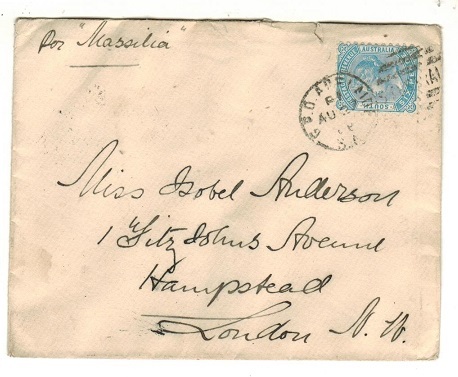 cover addressed to UK (some edge faults due to opening) bearing 2 1/2d blue adhesive tied by GPO ADELAIDE/SA cds. AUSTRALIA (South Australia) - 1895 2 1/2d rate cover to Ireland used at GPO ADELAIDE. 1895 (FE.20.) 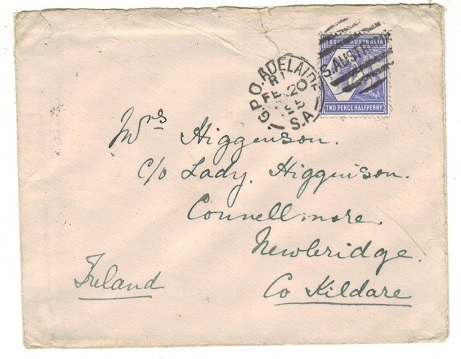 cover addressed to Ireland (ex reverse flap) bearing 2 1/2d adhesive tied by GPO ADELAIDE/SA cancel. AUSTRALIA (South Australia) - 1888 6d rate cover to UK used at GPO ADELAIDE. 1888 (AU.27.) 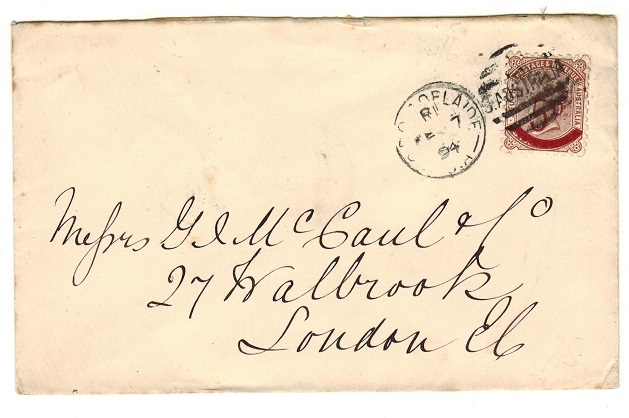 cover addressed to UK (ex part of reverse flap due to rough opening) bearing 6d adhesive tied GPO ADELAIDE/SA cds. AUSTRALIA (South Australia) - 1893-98 1d dark brown PSC used locally at JAMESTOWN. H&G 3. 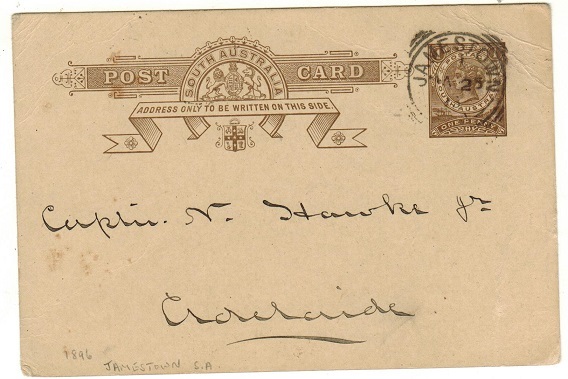 1893-98 1d dark brown on cream postal stationery postcard (minor corner bend) addressed locally & cancelled by squared circle JAMESTOWN cds dated MA.25.96. H&G 3. 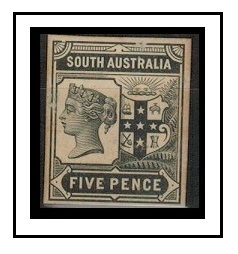 AUSTRALIA (South Australia) - 1896 1d 'OS' PSC used locally at ADELAIDE. H&G 3. 1896 'O.S.' 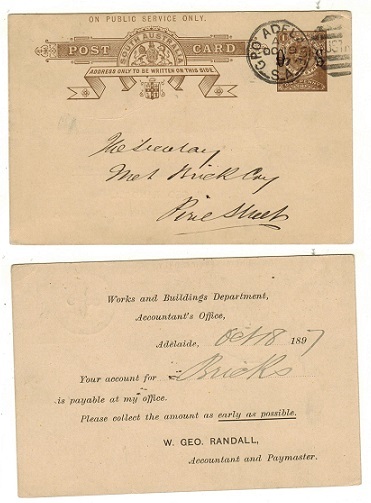 1d dark brown 'On Public Service Only' postal stationery postcard addressed locally with pre-printed reverse for use by the 'Works and Buildings Departement' cancelled by GPO/ ADELAIDE/SA cds dated OC.19.97. H&G 3. AUSTRALIA (South Australia) - 1899 1d 'OS' PSC used locally at ADELAIDE. H&G 4. 1899 'O.S.' 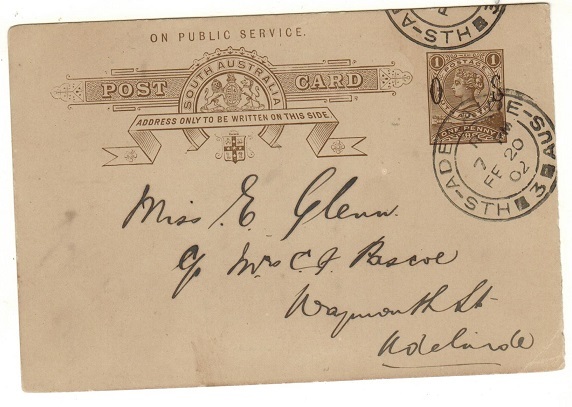 1d dark brown 'On Public Service' postal stationery postcard addressed locally (genuine use) and cancelled by ADELAIDE/STH AUS/3 cds dated FE.20.02. H&G 4. AUSTRALIA (South Australia) - 1902 inward postcard with ST.PETERS arrival. 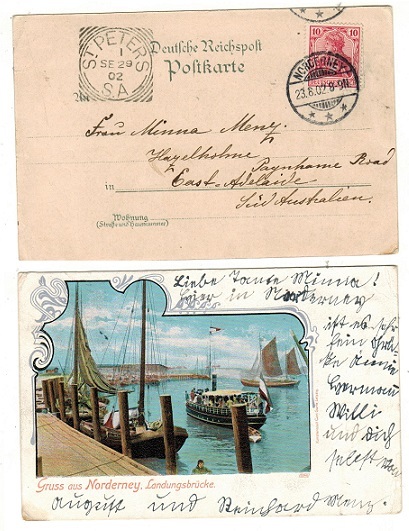 1902 inward coloured postcard from Germany with fine squared circle ST.PETERS/S.A. arrival cds dated SE.29.02 code 1. AUSTRALIA (South Australia) - 1904 2d rate (spiked) cover to Tasmania with KADINA RAIL b/s. 1904 (DE.10.) 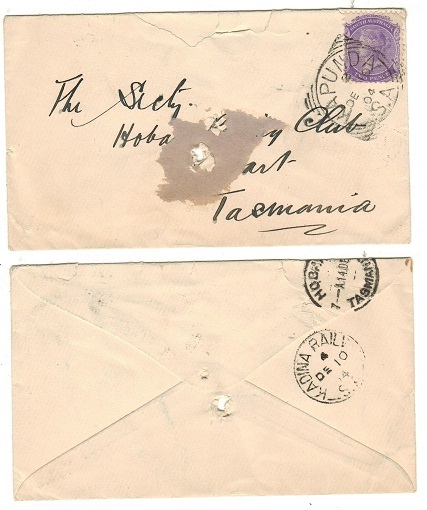 cover addressed to Tasmania bearing 2d violet adhesive tied by squared KAPUNDA/ S.A. cds. The cover has remnants of Tattestall label on front and is spiked twice. The reverse shows a KADINA RAIL/S.A. cds dated the same day. AUSTRALIA (South Australia) - 1874 6d rate cover to UK used at PORT LINCOLN. 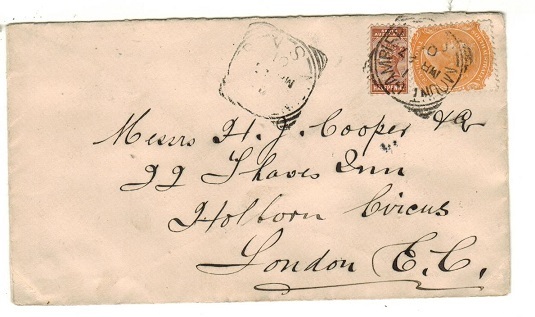 1874 cover to UK bearing 1869 6d Indigo adhesive (SG 74) showing major variety MIS-PERFORATED AT RIGHT resulting in a dramatically reduced stamp (Vertical perfs running from the 'E' of Postage to the last 'E' in Pence) & cancelled by light '80' duplex with part PORT LINCOLN cds alongside. GPO ADELAIDE/S.A. transit b/s with red London Paid arrival. AUSTRALIA (South Australia) - 1883 1d violet PSC overprinted 'OS' used at ADELAIDE. H&G 1. 1883 1d Violet on cream (type 1) postal stationery postcard ovpt'd 'O.S.' 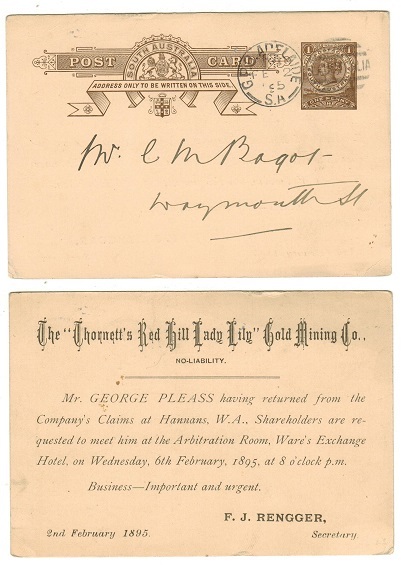 & pre-printed on reverse by 'Government Printing Office' subscription request. Addressed locally & cancelled GPO ADELAIDE & dated DE.21.91 code K1. H&G 1. Scarce. 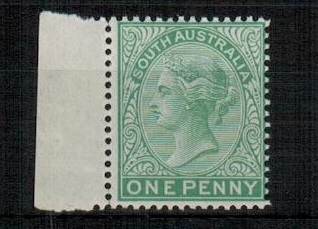 AUSTRALIA (South Australia) - 1889 1d green stationery wrapper used at ADELAIDE. H&G 4. 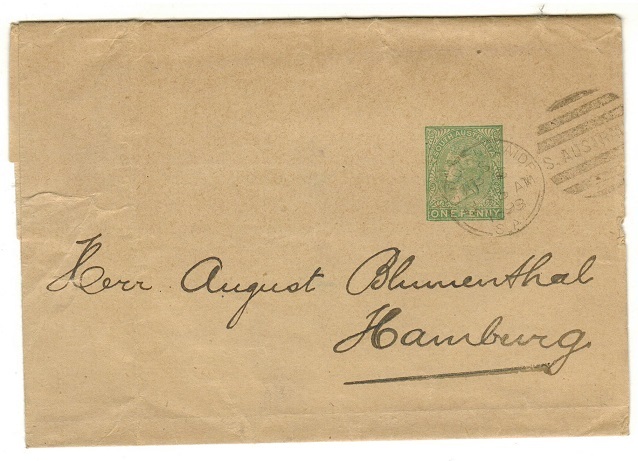 1889 1d Green on buff postal stationery wrapper addressed to Hamburg & cancelled GPO ADELAIDE & dated AP.6.1898. H&G 4. AUSTRALIA (South Australia) - 1899 1d green postal stationery wrapper unused SPECIMEN. H&G 4. 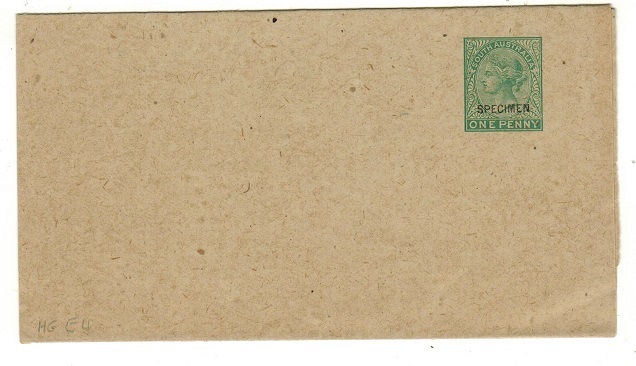 1889 1d green on light grey-buff paper postal stationery wrapper in unused condition without headings and overprinted SPECIMEN in small capital type. H&G 4. 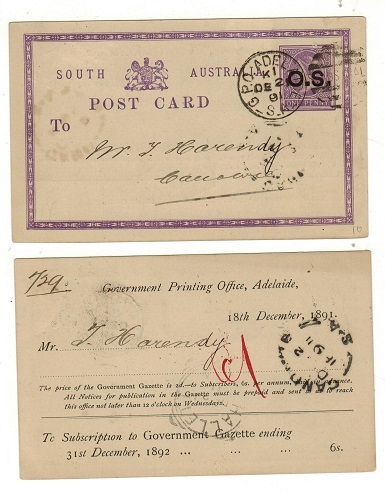 AUSTRALIA (South Australia) - 1894 cover to UK bearing 5d on 6d surcharge used at ADELAIDE. 1894 (FE.7.) 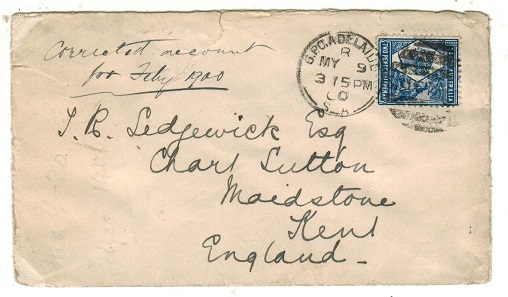 cover addressed to UK bearing 5d on 6d surcharge (SG 230) tied by ADELAIDE/ AUSTRALIA cancel. A scarce stamp used on cover. 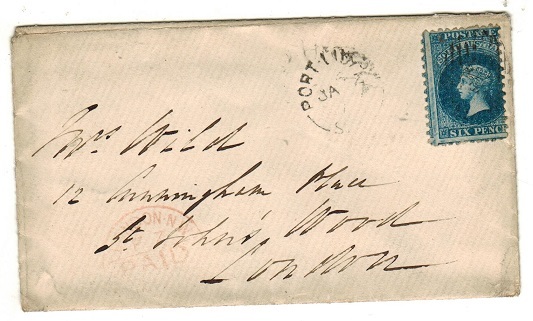 AUSTRALIA (South Australia) - 1858 2d rate cover addressed to Sydney struck by starburst '9' h/s. 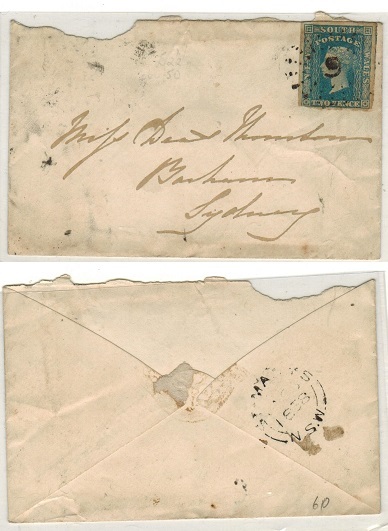 1858 cover addressed to Sydney bearing 2d blue adhesive tied by starburst '9' cancel with light ST.MARYS/NSW b/s. The cover has faults and is missing its back flap. AUSTRALIA (South Australia) - 1893 1d dark brown PSC used locally from ADELAIDE. H&G 3. 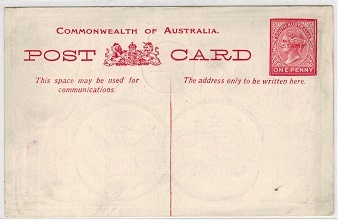 1893-98 1d dark brown on cream postal stationery postcard addressed locally (pre-printed reverse) & cancelled by GPO ADELAIDE cds dated FE.2.95. H&G 3. 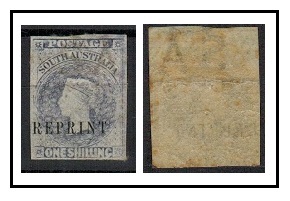 AUSTRALIA (South Australia) - 1884 5d IMPERFORATE PLATE PROOF. 1884 5d IMPERFORATE PLATE PROOF cut to size (SG type 23) printed in black on thick card. Very lightly aged. AUSTRALIA (South Australia) - 1861 9d rate cover to UK. 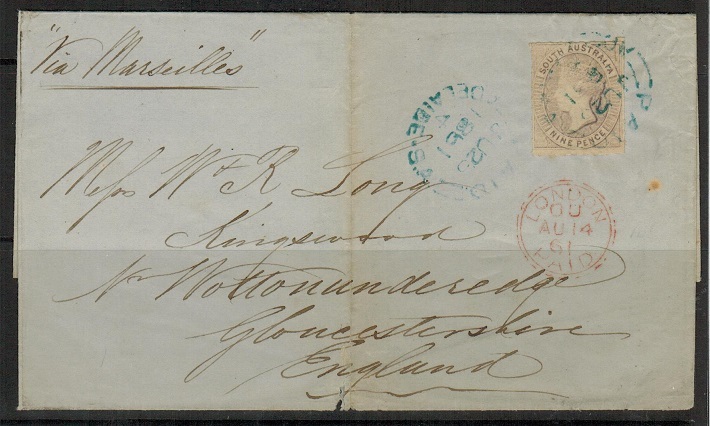 1861 (JU.25) outer wrapper addressed to UK (central filing fold) marked in manuscript 'Via Marseilles' & bearing 9d rey-lilac adhesive tied by PAID/ADELAIDE S.A. h/s applied in blue. (RL type 8). AUSTRALIA (South Australia) - 1908 1d PSC depicting 'Hindley Street' unused. H&G 8 (15). 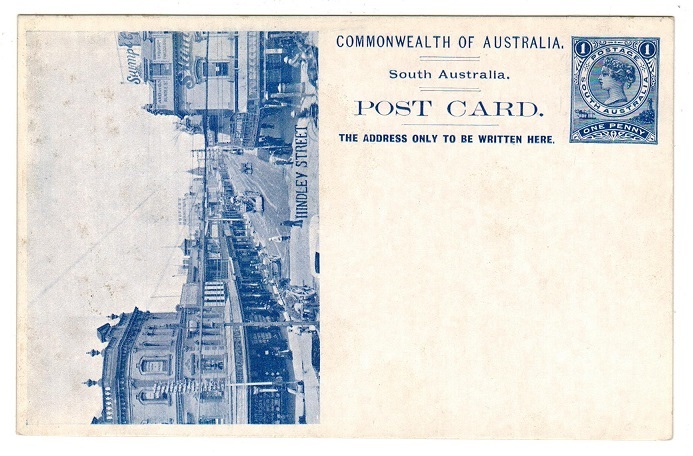 1908 1d dark blue on white postal stationery postcard depicting 'Hindley Street' at left. Fine unused but with a few hints of ageing at left edge and reverse top. H&G 8 (15). Scarce. 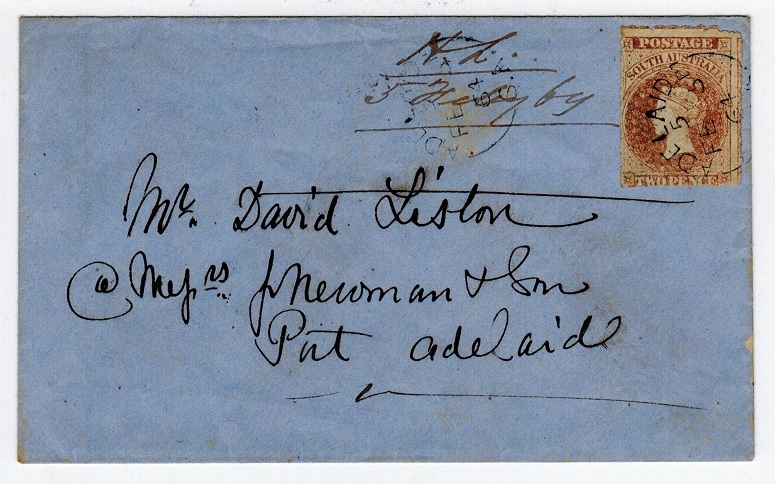 AUSTRALIA (South Australia) - 1900 stampless local cover with red DEAD LETTER OFFICE/ADELAIDE cds. 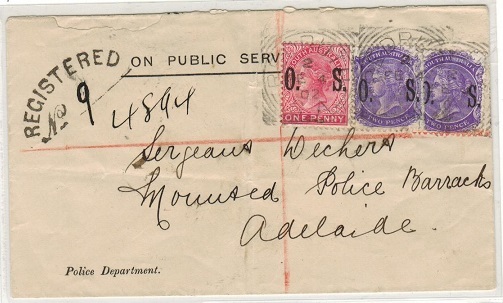 ON PUBLIC SERVICE ONLY stampless official envelope to Broome W.A. with superb red DEAD LETTER OFFICE/ADELAIDE cds dated AU.30.00. (Central fold). Perth b/s. AUSTRALIA (South Australia) - 1892 cover to USA with 2 1/2d on 4d surcharge used at SEMAPHORE. 1892 (NO.24.) 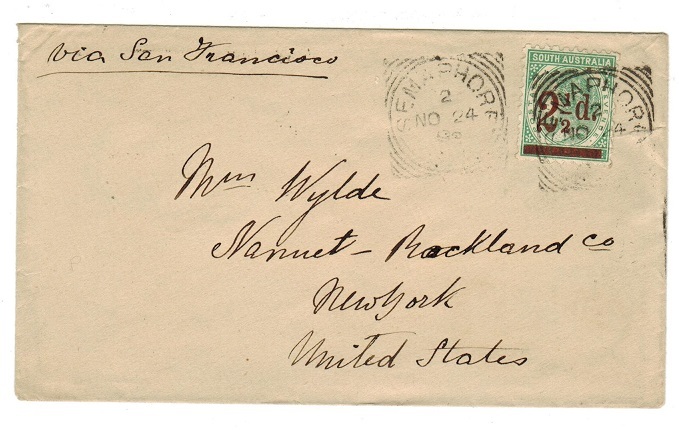 cover addressed to USA bearing the 2 1/2d on 4d pale green surcharge adhesive (SG 229) tied by squared circle SEMAPHORE cds with code '2'. A nice use of this stamp within period. 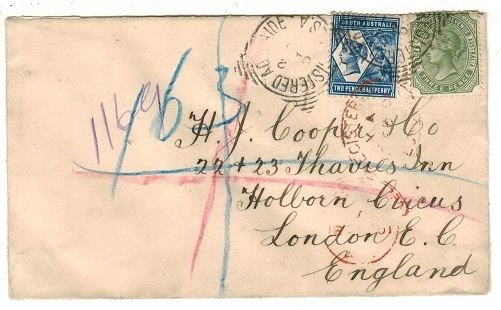 AUSTRALIA (South Australia) - 1895 cover to UK with 2d used at CLENELC. SOUTH AUSTRALIA - 1895 (JY.13.) 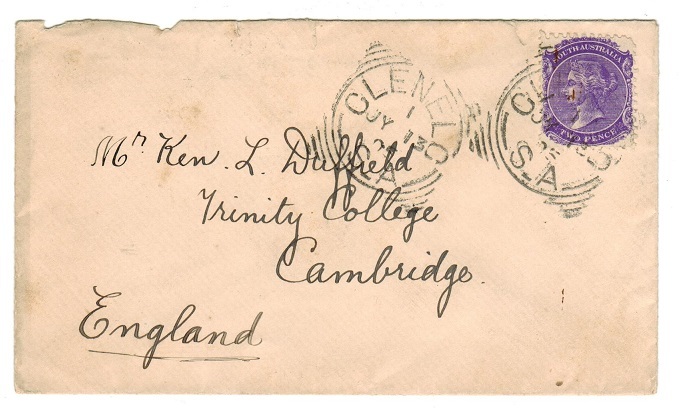 cover addressed to Uk bearing 2d violet adhesive tied by squared circle CLENELC/S.A. cds. AUSTRALIA (South Australia) - 1893 1d PSC uprated from ADELAIDE. H&G 3. 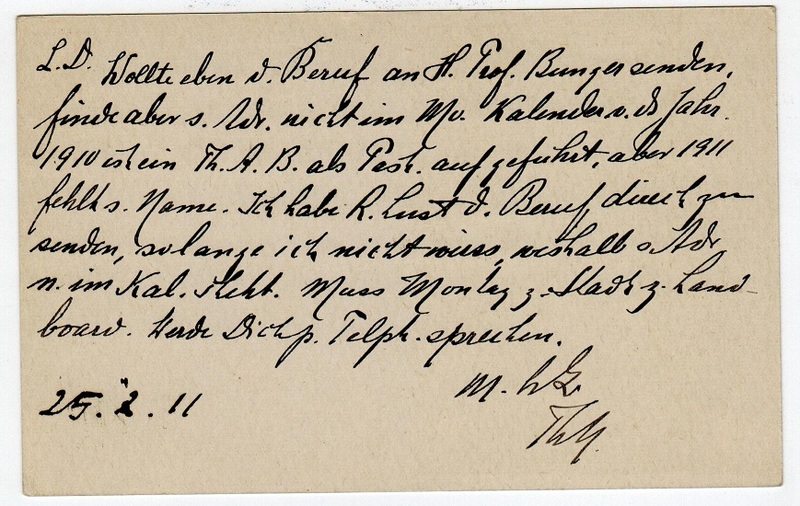 1893-98 1d dark brown on cream postal stationery postcard addressed to Germany bearing additional 2d orange adhesive (SG type 12) tied by GPO ADELAIDE/SA-S.AUSTRALIA cds's dated JU.21.97. H&G3. AUSTRALIA (South Australia) - 1891 OHMS cover to New Caledonia with 2 1/2d on 4d 'OS' use. 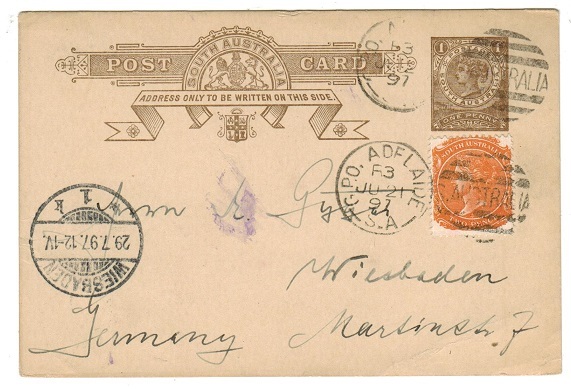 1891 use of O.H.M.S./E.12 envelope (226x102) addressed to New Caledonia (scarce) with fold at left but beraing a fine example of the 1894 2 1/2d on 4d green adhesive with 'O.S.' (SG O58) overprint tied by S.AUSTRALIA barred duplex with GPO/ADELAIDE cds dated NO.30.98. Exceedingly rare stamp used on cover. 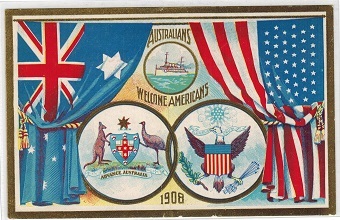 AUSTRALIA (South Australia) - 1908 1d 'Welcome Americans' PSC unused. H&G 9. 1908 1d carmine on white special AUSTRALIANS WELCOME AMERICANS 1908 postal stationery postcard in fine unused condition produced to welcome the American fleet. A scarce card. H&G 9. 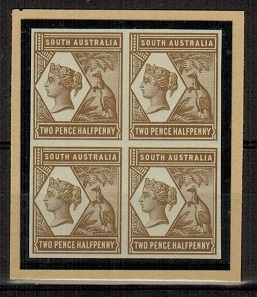 AUSTRALIA (South Australia) - 1894 2 1/2d IMPERF COLOUR TRIAL blk x4 in light brown. 1894 2 1/2d IMPERFORATE COLOUR TRIAL printed in light brown in a fine block of four on unwatermarked paper. SG type 22. 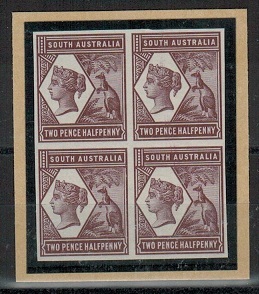 AUSTRALIA (South Australia) - 1894 2 1/2d IMPERF COLOUR TRIAL blk x4 in claret. 1894 2 1/2d IMPERFORATE COLOUR TRIAL printed in claret in a fine block of four on unwatermarked paper. SG type 22. 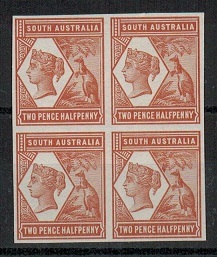 AUSTRALIA (South Australia) - 1894 2 1/2d IMPERF COLOUR TRIAL blk x4 in orange-brown. 1894 2 1/2d IMPERFORATE COLOUR TRIAL printed in orange-brown in a fine block of four on unwatermarked paper. SG type 22. AUSTRALIA (South Australia) - 1855 6d deep blue REPRINT. 1855 6d deep blue in fine unused condition of the re-print on 'SA' watermarked paper & h/s'd in black REPRINT. AUSTRALIA (South Australia) - 1855 1/- violet (SG 4) REPRINT. 1855 1/- violet (SG 4) in fine unused condiiton of the reprint on 'SA' watermarked paper h/s'd in black REPRINT. This colour being sent to the Colony but not actually issued. AUSTRALIA (South Australia) - 1908 illustrated PSC depicting 'Kookaburra Birds' H&G 8 (16). 1908 1d purple-brown on white pictorial postal stationery postcard addressed locally to the college at Unley depicting Kookaburra birds. Long message on reverse but uncancelled with the stamp having pencil cross. H&G 8 (16). AUSTRALIA (South Australia) - 1864 2d roulette on cover from ADELAIDE. 1864 (FE.5.) cover addressed locally bearing rouletted 2d (SG 25?) tied by crisp ADELAIDE/S.A. cds. PORT ADELAIDE b/s.